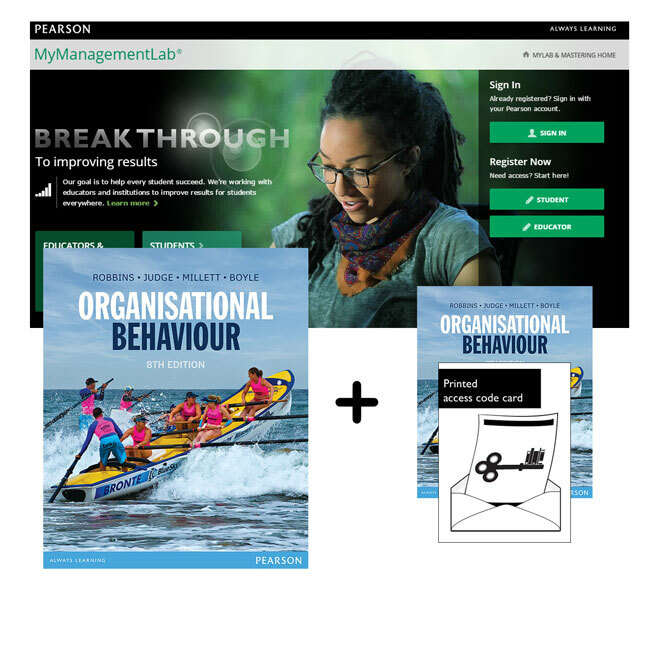 This pack contains 1 copy of Organisational Behaviour + 1 printed access card to MyLab Management Lab with eText. * an understanding of why these principles are important and relevant (whether or not you ever become a manager). MyLab Management is designed with a single purpose in mind: to improve the results of all higher education students, one student at a time. By bringing business concepts to life, it helps improve your results. It’s a system designed to work alongside this text so you can practice what you learn, test your understanding and pursue a personalised study plan that helps you better absorb course material and understand difficult concepts. MyLab Management combines homework, revision and adaptive multimedia learning tools with an eText version of Organisational Behaviour. Interactive exercises will build up your skills and encourage self-reflection, for example, NEW Personal Inventory Assessments, NEW ‘Think Like a Manager’ videos and decision-making simulations. Access can be via laptop, iPad or Android devices, making MyLab Management perfect for when you study on-the-go. MyLab Management is not a self-paced technology and should only be purchased when required by an instructor. The duration of access to MyLab Management is set by your instructor for your specific unit of study.